That’s the million dollar question. The answer is, yes, kind of. Vitamins have been proven to help promote hair growth and the general health of your hair, but they simply don’t work for everyone. While we’d be the first to tell you a new wig or hair topper can do amazing things for your hair, vitamins can be a great place to start if you’re just starting to experience thinning hair or hair loss that is not related to medical issues. Natural vitamins are part of everyday life, and an essential element for your health, but did you realize they’re also essential for your hair? For some, vitamins are a safe, natural way to help with thinning hair or hair loss. They can’t help with hereditary or medical hair loss, but they can help delay the onset of thinning hair. The vitamins below offer a great place to start: Amino Acids (Cysteine, Cystine, Methionine, Tyrosine), Beta Sitosterol, Biotin, Grape Seed, Inositol, Iron, Omega 3, Vitamins A, B, C, D, E and Zinc. 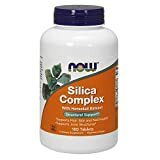 We’ve listed 20 vitamins for hair loss below from Amazon.com. Have you had luck with these? Let us know! DO YOU KNOW THE MAIN REASON WOMEN STRUGGLE WITH THINNING HAIR? 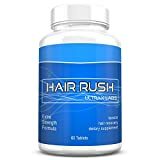 - Some women have very specific genes that make it harder to absorb the nutrients your hair needs to grow quickly and stay healthy and rich with keratin, the protein in your hair that leads to silky, frizz-free hair. A NATURAL SOLUTION BASED ON EVIDENCE - We scoured through scientific journals and met experts to develop the best formula we could to make your hair thicker and healthier (while growing faster and tackling the root of hair loss). Kerotin also contains the right ingredients to improve the suppleness and sheen of your skin and nails. 16 SCIENTIFICALLY DOSED NUTRIENTS - Our formula has specific doses of 16 different hair growth vitamins and minerals. We then added Biotin, an ingredient that helps your hair absorb them more efficiently while improving the strength and speeding up the growth of your hair. 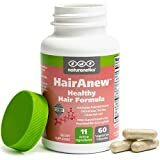 DAIRY, SOY, ALLERGEN, GMO FREE - There are NO chemicals or preservatives in our hair growth formula, so you can grow fuller and more beautiful hair skin and nails naturally. 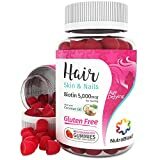 100% MADE IN THE USA - Kerotin hair growth products focus on providing effective hair growth formulas with the highest quality ingredients available on the market and is one of the most popular hair skin and nails vitamins. 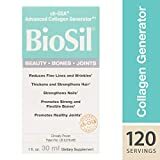 BEAUTY, BONES, JOINTS: Give your body comprehensive collagen support like only BioSil Beauty, Bones, & Joints can provide. DIY COLLAGEN: Encourage collagen production to help your body smooth wrinkles and fine lines for healthy, plump skin. 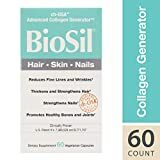 OUR BEAUTY SECRET: ch-OSA (choline) helps generate collagen and keratin to support thicker, stronger, and more luxurious hair and nails; 100% vegan. WHAT'S BEAUTY WITHOUT STRENGTH: Strengthen cartilage and bone with collagen support, an essential building block to promoting flexibility and comfort. 100% SATISFACTION GUARANTEE TRY RISK FREE - 100% MONEY BACK GUARANTEE: Feel Great or Your Money Back!! Every Purchase is Backed by our 1 Year Empty Bottle Guarantee - If you are Not Fully Satisfied for any reason we will refund your money no questions asked. BEST SOURCE of MEDIUM CHAIN FATTY ACID(MCFA) found in nature; largely consisting of lauric acid, caprylic acid, and capric acid. This allows for an incredible array of health-promoting properties. MCFA's are metabolized in the body and used for energy production and thus seldom end up as body fat or as deposits in the vascular system; they produce energy, not fat. Medium chain fatty acids do not have a negative effect on blood cholesterol and may help to protect against cardiovascular problems. Coconut oil acts as both a FOOD and a MEDICINE. It works to improve the absorption of both minerals (particularly calcium and magnesium) and vitamins. Such vitamins include the ever so important B-complex vitamins as well as the fat soluble vitamins A,D,E, and K. In addition, coconut oil assists in the absorption of some amino acids. Coconut oil is revered for its ability to stimulate the body's metabolism, increase energy, and improve thyroid function. All of these factors work to reduce unwanted body fat and form the basis of why coconut oil is often recommended for healthy endeavours. A great addition to any diet. 100% SATISFACTION GUARANTEED: Feel healthier with our pure coconut oil or your money back - no questions asked! 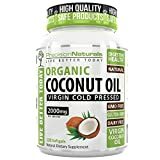 ORGANIC COCONUT OIL - HIGHEST GRADE AVAILABLE: Freshly made from Cold-Pressed Organic Coconuts, our coconut oil supplement is 100% Pure, Extra Virgin, Unrefined & Gluten FREE, Non-GMO and Solvent FREE. The best coconut oil pills and coconut oil for skin in the market. AMAZING BEAUTY & HEALTH BENEFITS INCLUDING WEIGHT LOSS: Studies show that coconut oil (cold pressed coconut oil) supports Healthy Weight Loss, Cardiovascular and Brain Health, Healthy Hair, Skin and Nails and Energy Levels. Helps with occasional constipation. 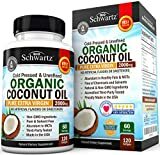 FORMULATED BY DOCTORS & MADE IN USA: For maximum potency and best results BioSchwartz coconut oil softgels (better than coconut oil capsules) are doctor-formulated and third party tested for highest purity and potency. Made in USA with compliance to cGMP standards. UNREFINED COCONUT OIL RICH IN FATTY ACIDS AND MCT: Our organic coconut oil (MCT oil occurs naturally in coconut oil) contains no trans-fats and is a rich source of Medium Chain Triglycerides (MCTs), such as lauric acid (C-12) and caprylic acid (C-8). 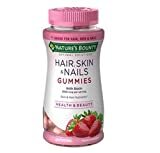 Nature Made Hair, Skin, and Nails is formulated with five key nutrients to help support healthy hair, skin and nails in one small softgel - Beta-carotene, Biotin, Copper, Vitamin C and Zinc. Biotin: May help support healthy hair, skin and nails in individuals lacking sufficient biotin. 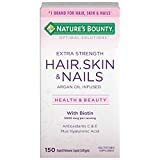 STRENGTHEN YOUR HAIR, SKIN & NAILS: Low levels of biotin can lead to brittle nails, dull-looking skin and thinning hair. That's why vitamin B7 is found in many cosmetics and health products for the hair and skin. When taken as a health supplement, biotin helps you maintain your hair and nails healthy and strong! 100% MONEY BACK GUARANTEE: At NutraBlast, we have absolute faith in our nutritional support products' quality. We use them ourselves daily to supplement our own diets, after all! If by any chance you do not find your flaxseed oil to your satisfaction, do not hesitate to contact us - our products are protected by a 100% money back guarantee, no questions asked! Combina vitaminas, minerales, antioxidantes y otros nutrientes de manera uniforme en un cabello, piel y uñas sanos. Incluye Biotina, vitaminas C y E para contribuir a tener uñas saludables. Estas afirmaciones no han sido evaluadas por la Administración de Alimentos y Medicamentos. Este producto pretende diagnosticar, tratar, curar o prevenir ninguna enfermedad. LET RADIANCE SHINE: Hair, Skin, Nails helps to restore healthy levels of collagen, keratin, and elastin to support youthful beauty. COLLAGEN: ch-OSA (choline) encourages your body to restore collagen generation, promoting smooth skin, flexible joints, and strong bones. ELASTIN: Promotes skin's ability to stretch and "bounce back," helping to reduce and smooth fine lines and wrinkles. EFFECTIVE FOR ALL HAIR TYPES: Works for women and men. Whether it's due to age, hormonal changes, diet, stress, or environmental factors, hair can become damaged and experience thinning and excess shedding. More times than not, we see the root cause of hair thinning and hair loss is a diet lacking in essential nutrients. STRONGER, LONGER, THICKER HAIR: HAIRtamin is a powerful hair nourishing supplement with clinically studied ingredients designed to support stronger, longer, thicker hair in as little as 60 days. EXTRA BENEFITS: Glowing Skin & Healthy Nails too, HAIRtamin has EXTRA benefits than just your hair. 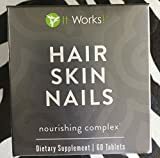 You'll enjoy nourished skin and stronger nails while your hair is growing faster, fuller, and healthier from the roots! SCIENTIFICALLY FORMULATED - Our proprietary blend of vitamins, minerals and herbs plus a potent super antioxidant complex synergistically promotes existing hair growth, prevents hair loss and shedding and increases follicle strength for the strong, shiny, healthy hair you desire. EASY-TO-REMEMBER: Just 1 capsule a day. 100% DRUG FREE: Gluten free. Vegetarian capsules. Cruelty Free. MADE IN USA: Quality ingredients. Money back guarantee. 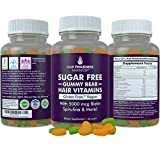 SUGAR FREE GUMMY VITAMINS - Unlike Many Sugar Bear Hair Gummy Vitamins Out There, Our Gummies Are SUGAR FREE But Comes In Tasty Strawberry And Coconut Flavor. 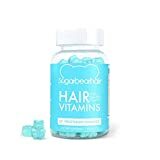 ALL NATURAL HAIR GROWTH GUMMY BEAR VITAMINS - Stimulates & Nourishes Hair Follicles & Scalp. Designed to Revitalize, Strengthen and Protect For Stronger, Thicker & Long Lasting Hair. Also recommended For Thinning Hair, Weak Hair or Hair Loss And Receding Hair. OVER 15 HAIR NURTURING INGREDIENTS: Including Biotin, Vitamin A, Vitamin C, Vitamin D3, Vitamin E, Vitamin B6, Choline, Iodine, Zinc & More! RISK FREE - Comes With Our 90 Day Customer Satisfaction 100% GUARANTEE! No Questions Asked, 100% Money Back Guarantee When You Purchase Today!